Are you tired of your guitar not sounding as good as Slash or Jimmy Hendrix while you’re jamming? Is your reverb more or a de-verb? Great reverb pedals are out there, you just need to find the right one for you. Investing in a good reverb pedal could make all of the difference in the sound that your guitar makes. There are many different types of reverb pedals, so you should understand what these different types of reverb pedals are and what exactly it is that they do. Spring: spring reverbs are created naturally (no electricity) by using a mechanical system. This system uses a transducer at one end and a pickup at the other end of a spring, which create and capture the vibrations within the spring. Most guitar amps have a spring reverb included anyway, so you probably already have one of these basic beauties. Room: these are used to enhance the natural sounds of an acoustic space, usually a small room. These reverbs typically have short reflections and dissipate very quickly. Hall: this type of reverb is used to mimic the kind of sounds you’d get if you were to perform in a large concert hall. This type of reverb has more reflections and much longer dissipation times. Best for: long/long dissipation sounds, complex reflections, large sounding reverberations. Plate reverb: this type of reverb is a large machine that feed the audio into large hanging sheets of metal to create a reverb that sounds more focused than a hall reverb, but still has a very long dissipation time. Best for: long, focused reverbs. Shimmer reverb: also known as pitch-shifted, the reverb effects produced by this kind of reverb have become common in guitar pedals over recent years. This type of reverb produces a sound that adds harmonies, which produce ethereal sounds. Best for: heavenly sounds, other-worldly ambience. Reverse reverb: this type of reverb pedal records the original reverb and then reverses it so that it leads into the sound source. Gated reverb: this kind of reverb silences or reduces the level of reverb when the volume of your guitar drops below a certain threshold. Convolution reverb: this kind of reverb uses audio sequences and complex algorithms to imitate a real acoustic space. Please note that the reverb pedals described in the above list are not necessarily in order from best to worst. Portability – the reverb pedal should be space saving and easy to carry around to differentiate it from competitors. Multiple sound options – the set should be upgradable and allow multiple reverberation options for the player. Reviews – we also take into account online reviews to help back up our opinions. Our top pick on our list of Best Reverb Pedals is the Boss RV-6 Digital Reverb. We love this pedal because it’s compact and versatile design packs a rich and expansive sound. The reverbs that this pedal produces are sophisticated, created by highly developed algorithms powered by cutting edge technology. This reverb pedal has a range of reverbs for you to choose from including effects such as shimmer delay and reverb, and dynamic. The array of textures that this reverb can produce will add a whole new meaning to your jamming sessions! The reverb pedal that we think is the best mini reverb pedal is the TC Electronic Flashback Mini. This little beauty certainly packs a punch, producing flawless sounds with many different settings to choose from. This small design is easily portable so you can take it to your friend’s house for a late night garage session, and easily transport it home after! What we think is one of the best overdrive pedals ever made is the Fulltone OCD Obsessive Compulsive Drive Pedal. Not only does this pedal run off of batteries, it also has some of the best quality components and packs a full bodied sound that is literally music to your ears. This pedal has a great overdrive and distortion pedal, and the sound that it creates is natural and smooth, perfect for acoustic or relaxed songs. What we think is one of the most unique sounding reverb pedals on the market is the Digitech POLARA Lexicon Reverbs Stereo Pedal with On/Off Switch. This pedal can produce an array of reverbs sounds, including room, plate, reverse, modulated, halo, hall, and spring! The actual device itself is compact ad easily transportable, and the true bypass circuitry preserves your tone in bypass. The operation is high voltage which means your signal quality will always be great, and the stomp lock knob guard locks your tone in place, meaning that there will be no accidental knob adjustments during your performance. The Boss FRV-1 63 Fender Reverb Pedal is a beautiful classic, which allows players to refine their tone. This pedal offers dwell, mix, and tone settings, meaning it is simple cut cheerful. This pedal is very simple and does exactly what it’s supposed to do, without all of the frills and extras that can often confuse players during their performance. This pedal is more flexible than your typical combo amp, and is also aesthetically pleasing, adding a sort of rustic look to your performance set. What we think is the most versatile reverb pedal is the Zoom ZMS70CDR MS-70CDR MultiStomp Chorus/Delay/Reverb Pedal. This product is easy to use, yet has a lot of different features. In total, this pedal has 86 effects, including 16 chorus effects, 29 delay effects, and 15 flangers/tremolos/vibratos/phases/modulator effects. And these effects can be used in any combination. Wow! The easy to use interface of this pedal includes LCD, footswitch, and an analog style cursor keys and parameter knobs. What we think is the most budget friendly reverb pedal is the Behringer Reverb Machine RV600. This reverb is cheap, but also contains a lot of features. This reverb pedal can deliver an array of reverb sounds, from classic spring reverb, to high-end studio reverbs, all at the touch of a foot switch. And it won’t break the bank! This reverb is powered by a 9V battery or a DC power supply, which unfortunately are not included with the sale of the reverb itself. We think that the Behringer DR600 Digital Reverb Digital Stereo Reverb Effects Pedal is a great balance of price and performance. This reverb pedal is budget friendly yet has been compared to state of the art studio processors. Cool right?! This pedal has 24-bit high-resolution stereo reverbs, including spring reverbs, plate reverbs, hall reverbs, gate reverbs, room reverbs and modulate reverbs. The components of this reverb are high-quality, and the rugged construction ensures long life, meaning that you will really get your money’s worth with this little beauty! 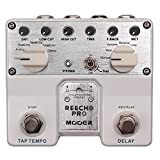 The Mooer Reecho Pro Twin Pedal is an agile pedal which allows more control over your reverb sounds than other models. This reverb pedal has 5 reverb effects with unique shimmer sounds. The dry and wet level controls are separated, and low cut and high cut control are both possible. This product produces excellent tones that are perfect for ambient swells, and the octave feature is great too! The HeadRush Pedalboard | Guitar Amp & FX Modeling Processor with 7” High Resolution Touch Display is rated as one of the best reverb pedals in the world, and for good reason. This pedal is powered by Eleven HD Expanded DSP, and has a hands-free edit mode. It has over 100 realistic FX, amp, cab, and microphone models, gapless preset siting modes with reverb delay/spillover. It also has a 7” high resolution touch interface with MIDI input and output, AND a looper with 20 minutes of recording time. This product is also easy to use, versatile, and easily portable. 1. What is a reverb? A reverb is created when sound waves reflect off surfaces in a room causing reflections to reach your ear. This happens in such quick succession that your ear is unable to interpret them as simple delays. Simply, a reverb is the persistence of sound after it occurs and reflects off of surfaces in the surrounding environment until its amplitude reaches zero. 2. 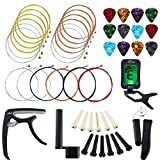 Do I need a reverb pedal? A reverb pedal is an essential tool for creating a “space” for your guitar to exist within a mix or live in the studio. A reverb pedal creates an atmosphere for your guitar whilst you are playing, intensifying the sound. You do not NEED a reverb pedal, you can still play your guitar without one. But a reverb pedal allows more diversity of sound for more varied playing. 3. Will my music sound as good without a reverberation pedal? The simple answer is, probably not, because reverb pedals are created with the sole intent to make your music sound better. 4. 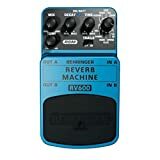 What is the best type of reverberation pedal for me? The answer to this completely depends on you, your type of music, and the type of sound that you are looking to create. 5. What are the best types of guitar? 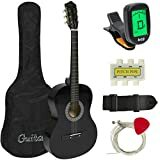 You can read all about the best acoustic electric guitar, best electric guitar, and even the best acoustic guitar here. You can also check out the best gifts to get for guitar players if you are buying the reverb pedal for a friend or family member who LOVES their guitar, and want to get them a little extra, too. 6. 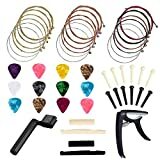 What is the best way to learn to place the guitar? As the old saying goes, practice really does make perfect. If you want to become a guitar playing professional in no time, invest in a good teacher, practice every day, and maybe check out some of these online guides to help you out! 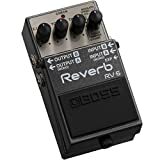 Overall, the Boss RV-6 Digital Reverb is the best reverberation pedal when it comes to portability, value for money, and depth and versatility of the sound produced. The psychology of any buyer is to search about the exact product they think they want to buy or to find considerably better and more suitable products that defeat the product they thought was perfect for them. Our review on the best reverberation pedal, the Boss RV-6 Digital Reverb should be convincing enough for you to conclude, but if you’re the type that thrives on more options, then a little bit of extra research could go a long way, including testing out different reverb pedals for yourself. There are many reverberation pedals out there that are universal in their design and functionality, and we felt that it is our duty to bring forth the ones that don’t disappoint. After-all, a product’s genuine response boils down to how its customers apprehend it, so let this accurate guide help you make the right decision.